Civil society figures in authoritarian Egypt and Sudan welcomed the toppling of a veteran president once seen as unassailable in dramatic scenes that recalled the wave of upheavals in 2011. Egyptian activists who helped mobilise demonstrators with their online calls to oust autocrat Hosni Mubarak eight years ago shared the bitter lessons they had learnt since their own revolution. "Congratulations to every Algerian and may we see each Arab country and its people free," wrote blogger Abderahman Mansour. Following the ouster of Mubarak, Egypt was wracked by years of instability that eventually saw the army force out his elected successor Mohamed Morsi. Now former military chief Abdel Fattah al-Sisi is firmly in charge and accused by rights groups of heading a regime more repressive than under Mubarak. Gamal Eid, an Egyptian rights lawyer, warned Algerians to remain on their guard after their own army chief played a key role in pushing Bouteflika from power. "My Algerian brother, don't leave the square until the military leaves the politics and government," he wrote on Twitter. "Don't be fooled by the military salute." Faced with the show of people power in Algeria, Sisi has warned against the dangers of protesting and on Sunday lamented the "lack of stability" caused by political confrontations. 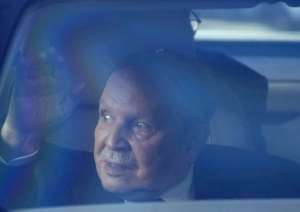 Hamza Meddeb, an independent analyst in Tunisia, said the end of Bouteflika's 20-year rule "reminds regimes like Egypt that nothing can be taken for granted". "It shows that the Arab Spring remains current, and not a matter of history, as the hope for change remains." But he insisted it was "unlikely" that the events in Algeria would have the same domino effect as the Tunisian uprising that set off the 2011 upheavals. "The people take much more precautions to try to avoid their hopes turning into nightmares." In Sudan, where protests sparked by economic woes have rocked the three-decade rule of President Omar al-Bashir, demonstrators said they felt bolstered by the success. "What happened in Algeria will give a new energy to the protest movement in Sudan," Omar el-Digeir, chief of the opposition Sudanese Congress Party, told AFP. "There are similarities between the demands of the two movements, although the problem in Sudan is more complicated than in Algeria." Protesters in Sudan said they are planning a rally for April 6 to march to the army headquarters and demand that the military stand with the people. "The Algerian and Sudanese protests come on the back of a wave of smaller, political and socio- economic protests since 2011 that suggested that the Middle Eastern counterrevolution amounted to putting a lid on a pot that could boil over at any moment," said James Dorsey, a senior fellow at Singapore's S. Rajaratnam School of International Studies. "The protests also suggest the fragility of hopes of Middle Eastern autocrats that China's model of successfully growing the economy, creating jobs and opportunity, and delivering public goods coupled with increased political control and suppression of rights would prove to be a sustainable model in their own backyard." The specific dynamics in Algeria -- which went through a brutal civil war in the 1990s -- appears to have prevented the security forces intervening to stamp out the demonstrations. 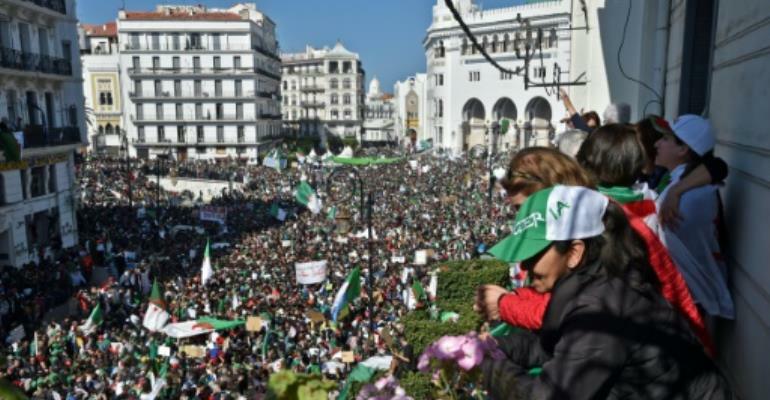 "Leaders as well as protesters in the region are drawing lessons from what is happening in Algeria," said Isabelle Werenfels, a research associate at the German Institute for International and Security Affairs. "But the difference in Algeria, is that the security forces, having the memory of the 1900s, were not too keen to act, whereas other regimes, could conclude that these movements should be forcibly suppressed." While nations further afield from the United States to France and Russia reacted to the upheaval in Algeria, countries across North Africa and the Middle East stayed silent. Werenfels said that governments around the region remained "extremely wary", even Tunisia, the only country to go through a democratic transition after the Arab Spring. "We are reliving our Tunisian revolution through our Algerian friends and see it is good to return to the fundamentals as Tunisia is struggling to move forwards," wrote political scientist Selim Kharrat. Geopolitical expert Michael Ayari said that Tunisia sees Algeria as a "bulwark" against a troubled broader region and views any instability there as "scary".